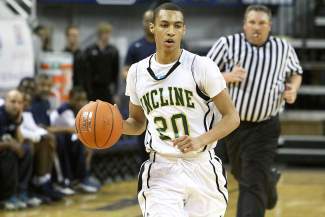 Incline senior guard Orin Porter was voted Northern Division III MVP. MVP: Melissa Gonzales – Pershing County – Sr. The Highlanders fared well in Northern Division III All-League voting, led by boys MVP Orin Porter and girls Coach of the Year Indra Winquest. The All-League awards were determined by the league’s coaches. In boys All-League voting, John Sharp of West Wendover was named Coach of the Year, while Porter, a senior guard for Incline, was named Most Valuable Player. Porter averaged 19.8 points per game and helped lead the Highlanders into the state final. Incline point guard Alex Zissis was the only junior voted to the All-League first team, which also included West Wendover seniors Kylar Sharp, Kaydn Sharp and Manny Flores, White Pine’s Nick Johnson and Battle Mountain’s Daniel Itza. Incline juniors Jack Clouthier, a guard, and Ben Snyder, a forward, both made the second team, while senior forward Christian Biscotti and junior guard Jack Bessette received All-League honorable mention recognition. For North Tahoe, senior guard Alex Tyler and junior forward Mitchell Myers received honorable mention. In girls All-League voting, Winquest, who led the Highlanders to their first state championship since 1985, was voted Coach of the Year, and Pershing County senior forward Melissa Gonzalez was voted Most Valuable Player. Incline junior guard Molly Franklin and sophomore forward Kira Porter were voted to the All-League first team, along with Yerington’s Celine Bethel, White Pine’s Amanda Allred, Pershing County’s Abby Bake and Battle Mountain’s Hannah Hale. Incline senior Kortney Solis, a guard, made the second team, while senior teammates Kerrie Tonking, Torii Baker and Elise Nelson received honorable mention.